A sleeping beauty in a pod or not? Coffee is a sleeping beauty, you have to awake her and give her the time to reveal her aroma. It’s the slogan of mister André Hoinkis, the Master Blender of Douwe Egberts. Time, however, is essential to awake that beauty. Unfortunately, nowadays, a lot of people don’t have (or make) enough time to make coffee. This year it’s exactly ten years ago that a wedding between two Dutch companies offered the perfect solution for that problem. Philips, an electronics company, and Douwe Egberts, the coffee company, started to cooperate. Together they invented a coffee pod system, called SENSEO. Instead of messing around with loose coffee, you simply add a pre-packaged pot of coffee to your machine, press a button, and wait for espresso to drip out of the spout. 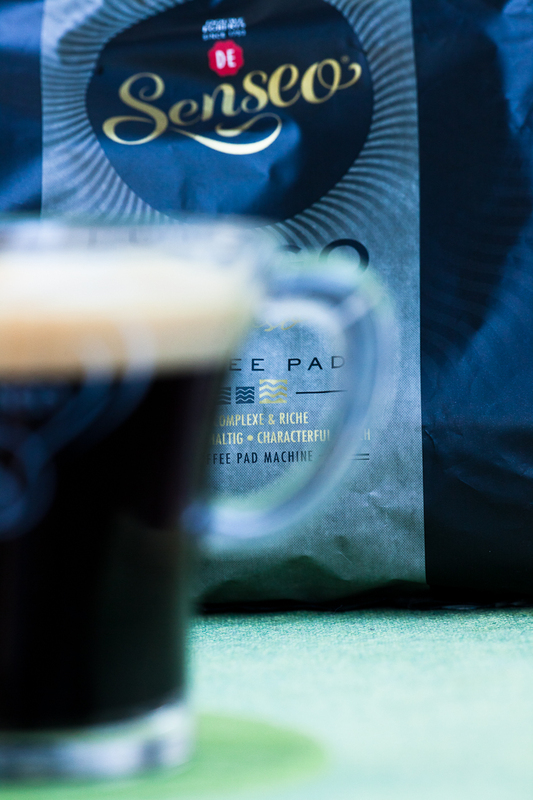 According to real coffee fanatics, using a pod machine is cheating your way to a cup of coffee. They can’t deny, however, that this system is a quick and hassle free route to a homemade espresso. From the beginning, this stress-free coffee making became very popular. More than 3.3 million SENSEO machines were sold in Belgium and Luxembourg since 2002. Each day more than 1 million cups of coffee are drunk in Belgium. Two million Belgian households would have a Philips SENSEO system in their kitchen. Pretty impressive statistics, if you ask me. Other famous pod systems are Dolce Gusto and George Clooney his – Nespresso. A couple of months ago, I was invited by Douwe Egberts and Porter Novelli to discover the new style and filters coffee flavors. Remember my blog post “Awake a sleeping beauty“. Now, they asked me again to review some of the new SENSEO pods. The big problem is that I’m not one of those two million households. I don’t have a SENSEO machine, because I don’t have enough room in my small kitchen and I just like filter coffee. (In fact, I’m now drinking a cup of coffee, Douwe Egberts BLACK.) Fortunately, my father-in-law also loves coffee and has a SENSEO machine. So we tasted together the three new SENSEO flavors. To be clear, this blog gives you my own delicate opinion. So if you would have another opinion, please don’t feel offended. Contrary, I would be pleased when you share your own opinion on my blog. The first one we tried, was REGULAR. It’s supposed to be a harmoniously balanced and rounded coffee, made of a blend of medium roasted Robusta and Arabica beans. According to me and my father-in-law it’s indeed not the coffee that you want when you woke up too early after a very bad night. If you like a strong, powerful coffee, this will not be your thing. However, if you prefer a balanced, – not too strong, not too mild, – this will be your cup of tea. I like it very strong, but if you like a regular one, it will be your favorite. Our second guinea pig was LUNGO Intenso, a coffee made finely ground dark roasted beans with an alluringly intense and rich arome. The palette of flavors isn’t as powerful as the BLACK one, but it’s more intense than the REGULAR one. Don’t expect the hyperactive muscleman in your cup, that you sometimes need at 6 a.m. Expect, on the other hand, a pleasant and calm companion for your homemade cheesecake in the afternoon. 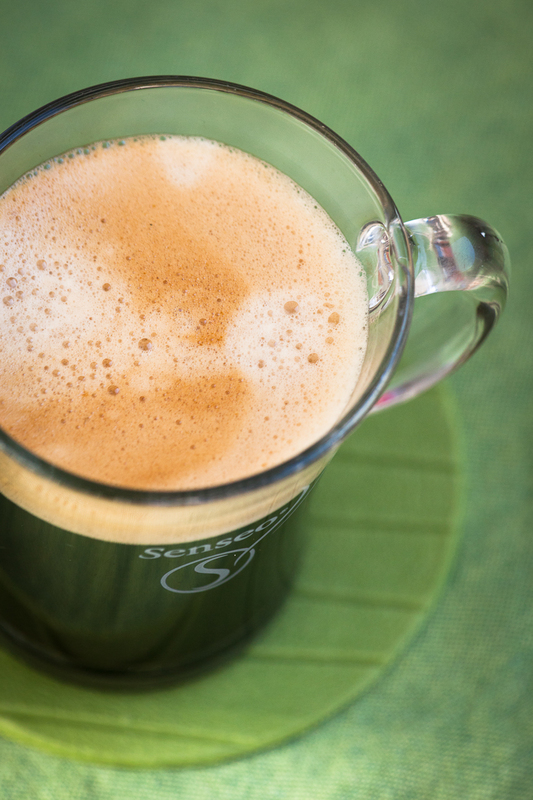 The last one was CAFE LATTE, a well-rounded coffee with a creamy frothy layer. This one was tested by me and my girlfriend. She always asks for cafe latte, when we are in bar or restaurant. So she is, according to me, the perfect jury. The layer of the coffee is really creamy. The flavors are again not overwhelming, but that’s of course not what you expect when you will buy this coffee. It can’t beat a fresh made coffee with steamed milk. 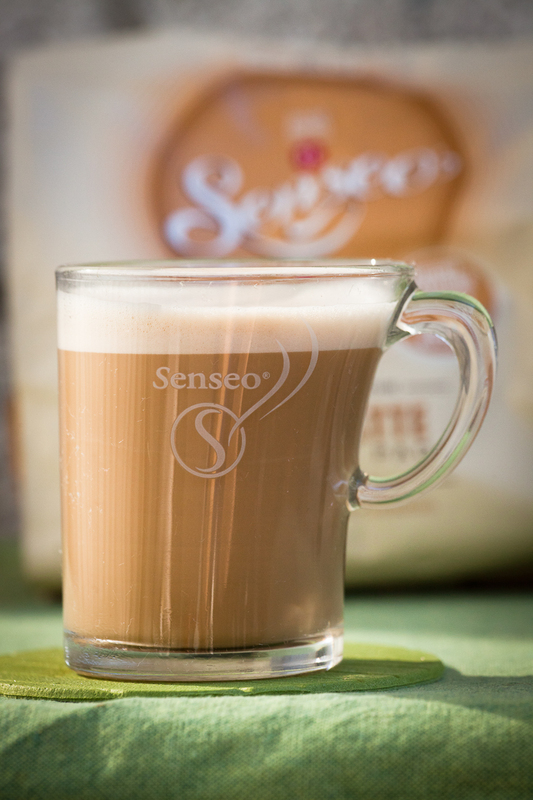 However, it’s a worthy alternative for people who like café latte, but don’t have the time to make it. Smooth, mild and creamy, that’s what you will get. It’s true that they didn’t blow me away. You have to keep in mind that I adore extra strong coffee. Ristretto, extra strong, black and forte are my favorite magic coffee words. The three I tasted are not supposed to be like that. I’m sure that when you more into balanced coffee, these three will be your thing. I’m really looking forward to try the other flavors of SENSEO, though. After all they released a lot of new ones. 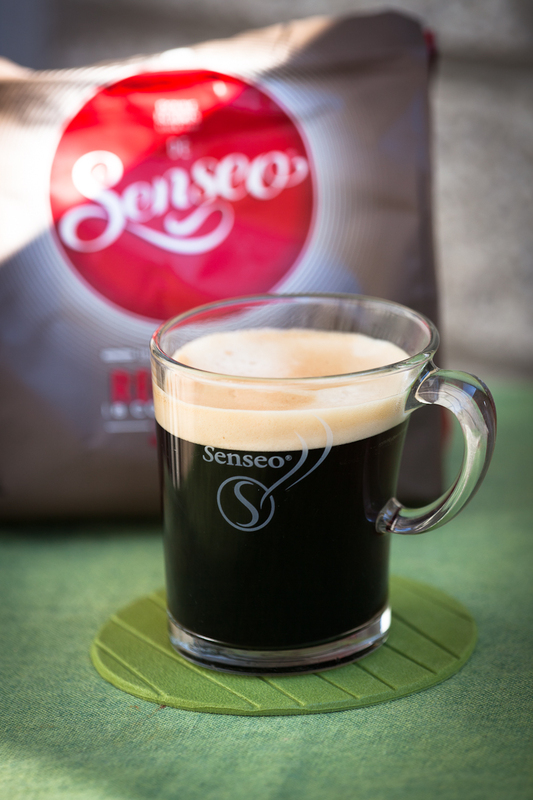 If I would have a SENSEO system, my kitchen would contain Lungo Forte, Kenya, Brazil, Extra Strong and Hello Morning!. Maybe you are still convinced of the words of Master Blender André Hoinkis that coffee beans are a sleeping beauty who needs time to awake. 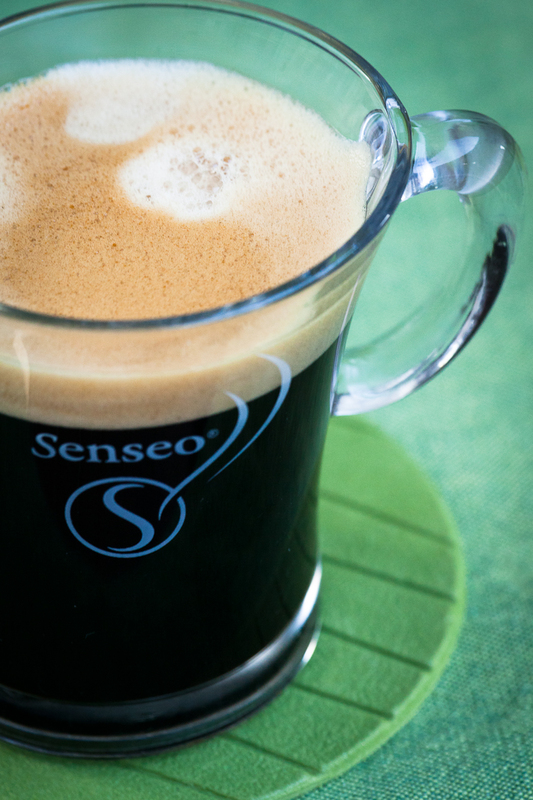 However, whether you think that SENSEO is coffee for sluggards or not, it gives you a perfect alternative for the moments when you just can’t make time. So in a sense, indeed, the pods contain sleeping beauties.